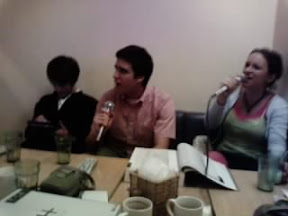 Thomas in Japan: Of all night karaoke and giant bugs. One thing about the Japanese, I don't know if they ever sleep. Maybe that's why they sleep on trains and buses and wherever they can, because they're too busy staying up all night doing karaoke. Oh yeah, that's right I said karaoke. Pronounced kah-rah-oh-keh, they sing songs of all varieties until day break. We joined them and it was awesome. There was a free drink bar and I think that's the only way I was able to keep going, with a constant stream of sugar flowing through me. We sang a large collection of the classic Disney songs, classic rock and more modern tunes, but by far my favorite was belting out Bon Jovi's Living on a Prayer. The Japanese are amazing singers, obvisously I don't know much about or Japanese, or singing for that matter, but they sounded great. When we finally got done, the sun was just rising and we were exhausted, but spirits were high all around. A few days later, we were helping Nagai-san (the boss) with some yardwork and a hornet the size of a baseball flew by. He told us not to kill it (like we could) because it would call all it's hive to come and attack us. Dang. Along those lines, all of the bugs over here are huge. The mosquitoes are big and relentless, spiders look like small dogs, the cockroaches are under your bare feet and ants like to find your scraps on the counter. We don't live in a dump by the way, it's a very nice house, it's just full of people and dirty sometimes. Not to mention the fact that we open the windows to let in some breezes. (It's very hot.) Not complaining though, just mentioning.